A report by UC Berkeley Goldman School of Public Policy researchers prepared for the City of Oakland last May found that Oakland's method for dealing with homeless encampments does more harm than good, and that the city's various departments don't have a coherent strategy to help the homeless. The result is that the city's homeless population continues to struggle to find safe spaces to exist. According to the report, each city department approaches the problem of homeless encampments with its own goals. "These often contradictory approaches became problematic when one department’s definition of a successful outcome directly undermined another’s," the Berkeley researchers wrote. The police department told the research team that they are "reluctant to issue citations against homeless individuals due to both the inefficiency of criminalizing homelessness, as well as the potential political ramifications." However, city councilmembers and the City Administrator's office are under intense pressure from homeowners, especially in West Oakland and North Oakland, to remove homeless camps. 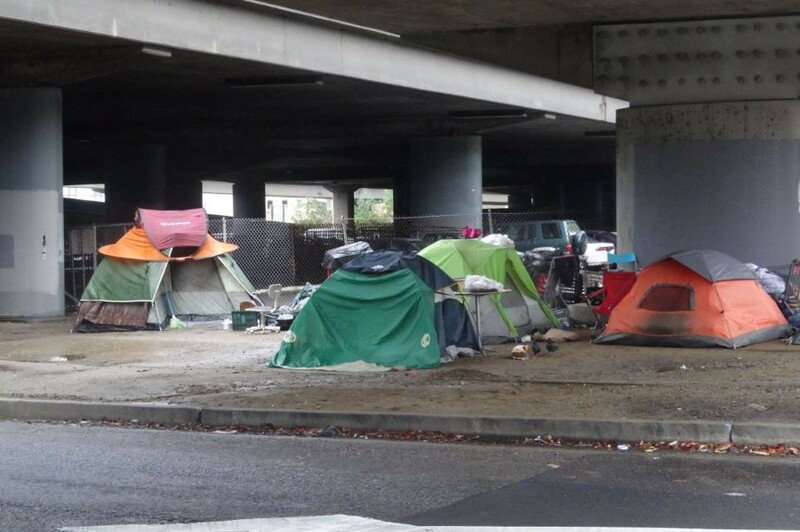 The result is that the Department of Public Works is increasingly directed to clean up and close homeless camps, and the police have been increasingly called to crack down on the homeless for crimes such as loitering and trespassing. "The tension between Oakland’s housed and unhoused residents is exemplified in Councilmember Lynette McElhaney’s [West Oakland and downtown] district, which has a disproportionate concentration of homeless encampments. The office receives numerous complaints from housed residents concerned about crime and other encampment-specific problems. While the Councilmember’s office agreed that the primary problem is a shortage of housing, the short-term concern of the office is addressing the immediate concerns of their constituents, which often requires directing Public Works to remove the encampments." 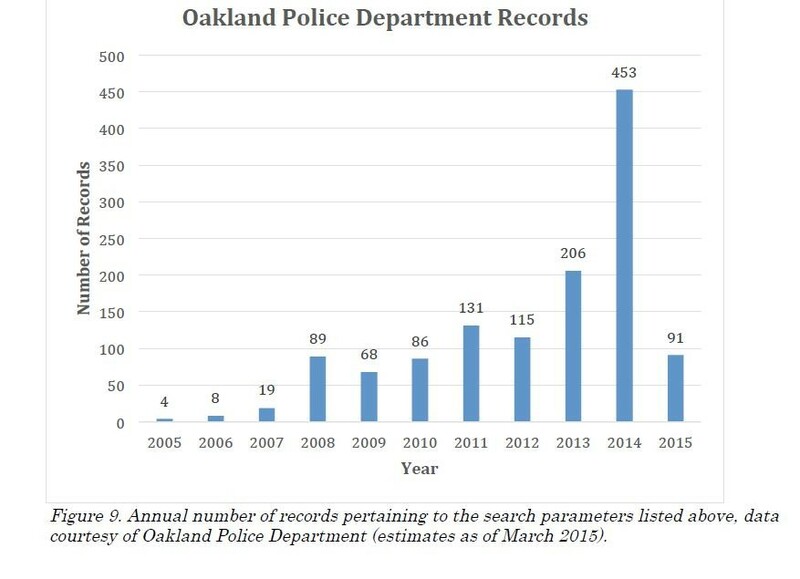 The researchers found that between 2005 and March of 2015 there were 1,270 OPD records of enforcement actions against "homeless" and "transient" camps, with a noticeable peak between 2013 and 2014. Oakland police records show a recent spike in calls regarding homeless camps. Email records reviewed by the Express illustrate the pressures put on city councilmembers to close homeless camps. For example, one homeowner in Rockridge wrote to Councilmember Dan Kalb earlier this year that the presence of homeless people living under the Highway 24 Bridge was a "direct conflict" with families living in homes nearby. "While I feel sympathetic for their plight, it isn't fair that hard working residents who have worked their tails off to earn the privilege of living in this neighborhood must be subjected to daily torment by the homeless," wrote the upset homeowner, whose identity was redacted by the city before the emails were made public. "We are done with this and expect more effective, more confident and more assertive action by OPD." The homeowner concluded the email with a warning: "Do we have the right to be free of danger to our children and illicit behavior unfolding right before our very eyes every day? Seems like not in Oakland, where the rights of the homeless far outweigh the rights of good law abiding homeowners and residents. You should not be surprised to see many good families moving away, seeking relief, refuge and safety beyond the hills in Orinda, Lafayette and Moraga." As I noted last week, Oakland Spent $72,000 Closing 162 Homeless Camps in 2015. The UC Berkeley team found that closing homeless camps can be harmful to camp residents whose belongings are sometimes confiscated or thrown away. "[E]ncampment residents may refuse to leave camps during cleanups in order to ensure that their belongings are not removed or discarded. As such, they often miss scheduled doctor, employment, or case manager appointments. Thus, cleanup efforts themselves contribute to the broader systemic problem that keeps encampment residents in a cycle of homelessness." The UC Berkeley study recommends that Oakland follow the lead of cities like Seattle and Portland and establish sanctioned homeless camps. Doing so could reduce the cost to the city of cleaning and closing the dozens of encampments throughout the city, while providing homeless people with more secure and healthy spaces to live. The full report can be downloaded here.